An old doe snorted. The unexpected warning came from the far side of the big swamp, a ways uphill from the maple at the bend in the trail that hugged the swamp’s edge. The unmistakable sound rolled up and down the swamp like the thunder from a close lightning strike. Peering through the brush I saw two bounding white tails flag side-to-side on the mucky path that wandered to the south island’s east bank. The air smelled warm, heavy with moisture waiting to fall at the first hint of dropping temperatures. Thick gray clouds hung low, but showed no sign of turmoil on that calm morning in mid-November, four days past the fifteenth, in the Year of our Lord, 1796. Not long after first light a gray squirrel ventured forth. A fox squirrel followed. The two rodents scrounged in the brown leaves, but made little noise as the summer skeletons were damp and supple. Then a blue jay began an insistent hollering from atop an oak on the south island. The snort came as no surprise. I heard many throughout the month; none directed at my humble existence. The deer appeared more cautious, looking about and lingering longer than normal. On one frosty morning, over the course of an hour, two young does attempted to cross to the south island three times, turning back each time due to some perceived concern. I supposed the two waving tails belonged to them. A stout red oak limb, festooned with brown, dead leaves that clung to every twig, served as my fortress that morning. The parent oak stood on the south side of a small rise, nestled among a host of tight-packed red cedar trees, about thirty paces up from the swamp’s west edge. Perhaps ten minutes after the doe’s snort, two ears twitched just over the knoll’s rise. A barren head popped up, then dropped down. The young doe was on the path that meandered upwind of the broken oak. I doubted she would pass without discovering my ambush, but she made no progress in my direction. An older doe wandered downhill, then slipped out of sight. Four ears perked up, all intent upon the big swamp. The pair stood for a dozen minutes or more, gazing with purpose down into the tawny sedge grass. The closest set of ears, the youngster’s, turned north, listening in my direction. The fox squirrel was behind me at that point. I heard it, too. She turned back, then both heads jerked a hand’s width higher. Even with bad ears, I heard the “splish… splish” of deer legs in the little creek. My eyes left the does. A foreleg rose and fell ten paces out in the sedge grass. The right foreleg stepped. That “splish” matched the movement. The oldest doe turned about and plodded back to the upper trail. After a long hesitation the younger doe followed. Out in the swamp, a thick neck watched. 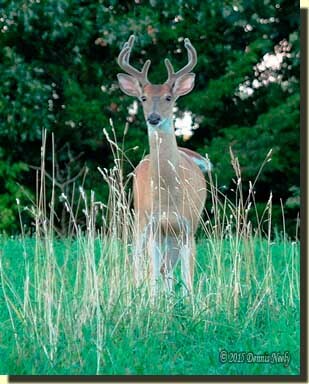 One evening in mid-August, the eight-point buck, still in velvet, wandered into the meadow. 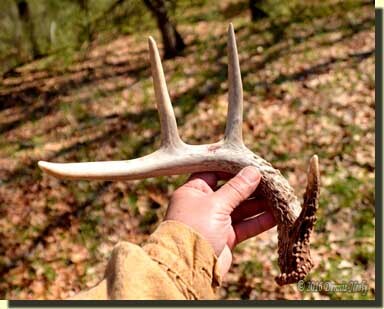 In time, a second-year 8-point buck found his way to the scrape under a scrub oak, down the slope from my lair. He sniffed and pawed a bit, by then broadside at thirty paces. The Northwest gun’s turtle sight knew the location, but gave no mind; “Old Turkey Feathers” remained at rest across my wool leggins. The buck did not freshen the scrape, but continued on his way with what little breeze there was at this tail. He slipped behind a bigger oak tangle where a massive, south-leaning fork crashed to the earth, bending over a dozen cedar trees with its burden. I pivoted a bit on the bedroll, but held the trade gun at bay. The buck walked into view a few paces from the swamp’s edge. He offered a superb shot, standing steady for several minutes as he surveyed the island. Then he flicked his tail and wandered out of sight. I learned a valuable lesson late in my teens. The opening day of Michigan’s firearm deer season fell on a Saturday. For weeks I had patterned a nice seven-point buck. He was a first year deer. Back then the fawns came early, giving plenty of time for growth. Many of the young bucks developed fair first-time racks, most in the six to eight-point range—none of the spikes and three-pointers we have today. I happened upon this buck’s habits early in November. He spent much of the day out in the river bottom. Back in the 1960s the whitetails moved from their night feeding ground to their day bedding areas up until 10 o’clock in the morning—none of the before dark/ after dark movement we have to cope with today. Anyway, this fellow passed through the corner of the big woods on his way to the deep cattails at the river an hour after sunrise, give or take ten minutes. That morning was clear, crisp and sunny. I sat downwind of his favorite path and waited. I could taste his back straps. He circled over the far hill on the early side of the schedule, showing no concern. He slipped into a little valley. I pulled the LeFever Nitro Special up and supported the double-barrel’s forestock with my elbow securely pressed into my left knee. My thumb twitched on the safety. I tried to calm my pounding heart. My heart doubled its pace. I scrambled to my feet and began a fast walk straight to the muzzle blast. In hindsight it wasn’t my best choice, given my tender age and vulnerability in the situation, but that was my reaction. No one had permission to hunt the farm. With no second shot, I had a good idea what to expect. I saw our neighbor from down the road approach the buck, which was dead on the ground. To add insult to injury, he called out for his son, who arrived about the time I was confronting this poacher. I kept a civil tongue, despite my anger and frustration. They never tagged that buck. The father just laughed and waived his shotgun in my direction as they dragged the deer off. It was a long, painful walk home. My father called the local Michigan Conservation Department post, but the deer was gone and nowhere to be found. Some years later, we had a fine buck that frequented the farm about every three days. I wanted that deer and decided not to “waste my tag” on any other. I passed on a number of smaller-racked deer, and each time I did, I remembered the cruel lesson of that first seven-point. In essence, once the shot is not taken, there is no guarantee a hunter will ever see that deer again. On that morning in 1796, I recalled my disgust with the neighbor and the painful lesson learned. A deep pang of anguish always falls upon me when I pass up a deer, followed a while later by a fit of second-guessing. I suspect those feelings result from the seven-point fiasco. I knew I might never see that eight-point again, but I also knew a good friend and his nephew were coming to hunt two days hence. In our conversations before the season opener, Tom said Zach had never gotten a deer, and had had few chances in his brief hunting career. He held out high hope for his nephew’s first trip to the North-Forty. As the buck walked off toward the south island, I kept thinking of Zach and how I wanted him to have a fair crack at that deer. Once he was gone, I settled back into my treetop fortress. A vague premonition swept over me, an inkling that I had just passed on my only chance to put fresh venison on the table. That 18th-century circumstance was too perfect; that eight-point buck gave me a half-dozen outstanding shots. As it turned out, even with a fresh dusting of snow, the eight-point never checked his scrape line, at least not while Zach sat hidden in the cedars. It was a huge disappointment for me, but I knew the risks of letting a buck walk and the slim probability of him wandering by while Zach waited in ambush. I never saw that buck again, and I attribute a large part of that to the whitetails going nocturnal. I never took a shot throughout November and December. But in retrospect, I would follow the same course a thousand times over, knowing Zach, or any first time hunter, was coming to the North-Forty. As a traditional black powder hunter, the historical me is not defined by the size or quantity of deer I stack up, or the number of times I choose not to. 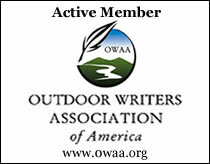 This entry was posted in Deer Hunts, Worth thinking about... and tagged Black powder hunting, Dennis Neely, historical trekking, Native captive, North West trade gun, Northwest trade gun, traditional black powder, traditional black powder hunting, traditional blackpowder, traditional blackpowder hunting, Traditional Woodsman. Bookmark the permalink.